How is everyone? I meant to get this posted earlier today, but I've been running behind. 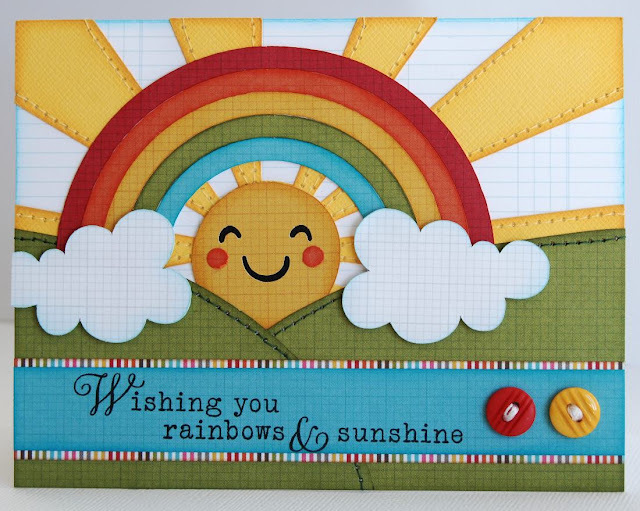 I made this little card awhile back in response to Paper Crafts Magazine's call for Sunshines and rainbows for their upcoming July/August issue. It didn't make the cut, but this happy little sunshine still has a special place in my heart. I used Simple Stories Snap Studio Mini 6x6 paper pad and a sentiment from Papertrey Ink's Up, Up & Away Sentiments set. I took my inspiration from this clip art that I found through google and pieced together various shapes from the Silhouette store to acheive the look I was going for which was a fun challenge. I am not sure why this didn't make the cut but oh lord is this so adorable!!! I love it!! How did you make your rays? Are they a silhouette cut? Well..they were wrong in not choosing your card---it is beyond adorable!